It’s a bird! It’s a plane! It’s Cher! The unkillable star swooped into Barclays Center on Friday with all the oddity and wonder of a superhero, if not a UFO. After more than half a century of media exposure, it’s still hard to prepare for the sight of a 68-year-old woman teetering on a sky-high platform, while crowned with a multitiered headdress of feathers, looking like nothing so much as the Queen of the Peacock People. Appropriately, Cher has called her latest show the “Dressed to Kill” tour, though it also finds her “Tressed” to at least maim. This particular number found Cher adorned with bales of blonde curls, cascading down a golden outfit swiped from the days when gladiators ruled. She looked like ancient Rome’s answer to Big Bird, with enough muscular, warrior/dancers surrounding her prove it. Later, Cher appeared in an amped-up version of that warren of black hair made iconic by the “If I Could Turn Back Time” video of the ’80s. “I can still get into my outfit — at almost 100,” she crowed, in one of many jokes about her age. “And what is your granny doing tonight?” she asked later. 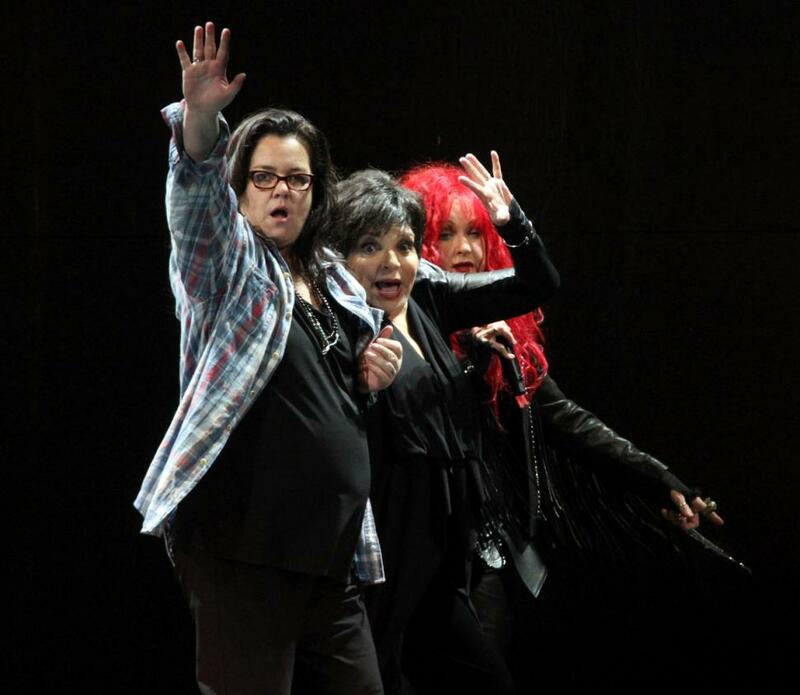 The show flipped through several gleefully garish chapters of Cher’s past. It featured a sizable Sonny & Cher segment, including “I Got You Babe” staged as a “duet” with a looming video image of the late Sonny. It’s a potentially squirm-inducing sight that Cher made moving by her clear affection both for him and her own history. She also recreated ’70s hits that functioned as much as comedy skits as songs — like the undyingly kitschy “Gypsies, Tramps & Thieves,” or “Half Breed,” in which Cher did her old Pocahontas outfit one better. She donned a head-piece of colors psychedelic enough to carry their own contact high. Needless to say, Cher gets the joke in all this better than anyone. But sometimes it seems like she gets it too well. The star can claim a seriously catchy, and impressively varied, trove of thrilling hits — from “The Beat Goes On” right through the new “Woman’s World.” And her vibrato-heavy, pansexual vocals have a timbre, and a style, like no other singer. Cher proved it in an anthem tailor-made for her role as the ultimate survivor: “You Haven’t Seen the Last of Me Yet,” from the bomb movie “Burlesque.” Here, she earned diva status as much through her undervalued power to belt as her will to gall. Of course, much of the show’s joy, and even its poignancy, came from its mission to defy common notions of taste, age and even self-parody. The lazy would call it camp. But it’s beyond that. Ultimately, it can only be described as just so incredibly Cher. Seems it was another amazing night. Note to reviewer: Check your facts. She’s still 67! Hey Christophe! Glad to hear that you had a great time and got to meet and take a pic with Dorian. Today is 5-14. I have 2nd row seats this Saturday night down here in South Florida. Will be meeting Cher briefly and a few of her dancers that I know. Very excited….haven’t been with her in 3 years now. Hoping that she will want to go out clubbing with the guys. Don’t know off hand if she has a show on Sunday. She really likes to go clubbing in NY,Florida, and NJ. She limits herself to 1 drink and still has the time of her life. That girl loves to dance! Anyway can’t wait for Saturday. Will fill you and everyone else here at Cherworld in on how everything turned out. Real happy that you had such a great time! no thats the video needed for “LOVERS FOREVER” the true queen of the night the vampire queen herself “CHER” ageless and sublime love you cher my darklady…………. 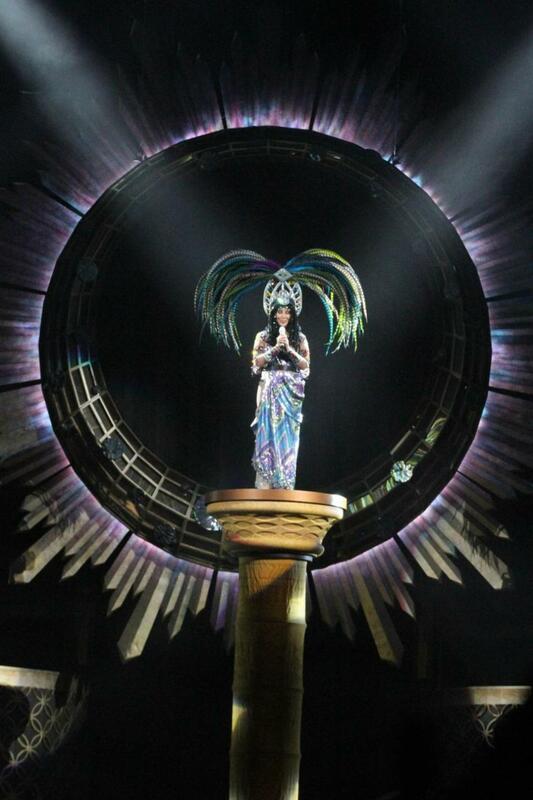 CHER will be back to NYC at Madison Square Garden 19, 20 of Sept, i am back there again to see her!! But for That think must show of What she is able …. Why not à vidéo of her in bed in love with à younger Man creazy of her. !!!! 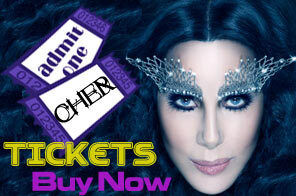 I Have loved this Woman sence the 70s, I seen her May 2 in Cleveland, she is still perfict I would love to be Mr.Cher! If I could only sleep with her one time,she is a ICON what were the other guys from the past thinking!!!! Happy Birthday baby. The 19 sept is someone want to join me ? I would like to be in B aéra is it good. ? She was in Denver on 6/28. I have always liked her, always wanted to see her perform. Yes the outfits she is know for are great, not the greatest stage show but that might be difficult to accomplish on the road. However, I saved up for this show and did not like paying $204.00 for not that good of seats to watch Cher lip sync through most of the show. Very disappointing.